The Marimba Angler is really all about speed. It has similar carrying capacity to the Kasai Angler, but it is faster. This makes it a great trawling kayak, and also ideal for fishing trips where you have to cover long distances. 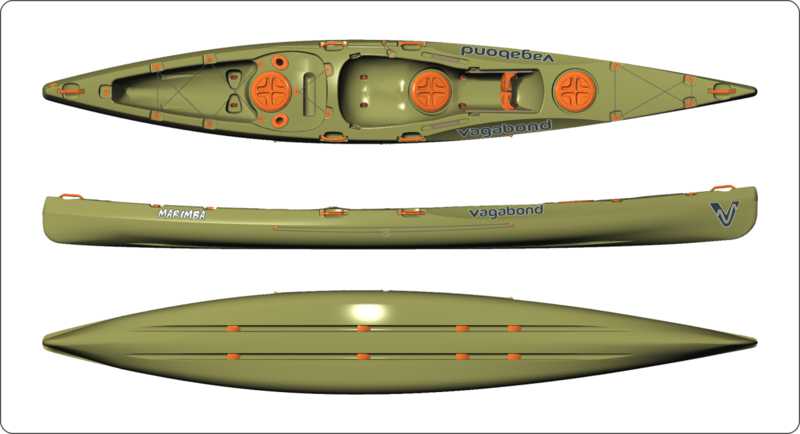 To create the Marimba Angler, we took the standard Marimba which already has a bunch of features that make it a great boat for anglers, and added some angling-specific fittings to it. Two flush-mounted Rod Holders are located behind the seat. Each rod holder has a Multifit positioned close by for securing your rods while paddling. Deck Rails allow you to personalise the deck by attaching items like a fish finder, GPS, camera or a selfie stick or on either side of the Sculpted Seat. An Anchor Trolley is also installed on the right side of the kayak. Like the standard Marimba, the Marimba Angler has adjustable Footrests, a Paddle Rest, Bungee Cord straps to secure gear to the bow and a sizeable Tankwell with Crate-Holding Indents. The Bottle Holder is positioned behind the seat, in the middle of a larger pocket where a hydration bladder can be fixed. It also features the Scupper Venturis that make paddling long distances through choppy waters a pleasure. To recap, if speed and trawling is your main priority, this is the boat for you. In addition, if you want one boat that you can use for fishing as well as fitness training, choose the Marimba Angler.